Oversharing on Facebook: researchers weigh in. 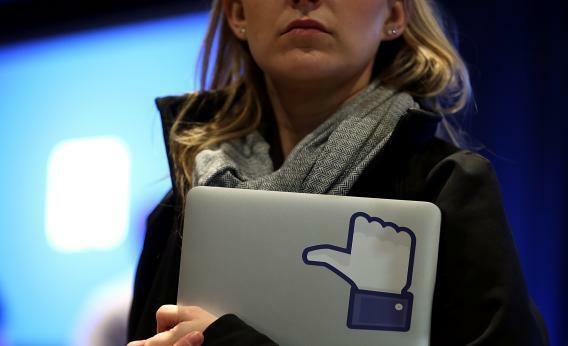 A Facebook employee holds a laptop with a like sticker on it during an event at Facebook headquarters. While difficult to measure, the Washington Post published a survey last spring stating that only 15 percent of American social media users feel they share either “everything” or “most things” online. That’s not a lot—especially considering that more than 60 percent of participants from Saudi Arabia admitted they belong in that same category. As the accompanying story implies, however, the survey doesn’t account for the vastly different cultures and social norms the various participants exist within. While tweeting about your aunt’s divorce might be considered taboo in one country, it might be received with a shrug in a nation inured to the antics of the Kardashians. According to a 2010 study, playfully titled, “Examining Students’ Intended Image on Facebook: ‘What Were They Thinking? !’ ” Facebook users who didn’t mind if strangers could view their profile, as opposed to those who did, were “significantly more likely to post inappropriate content and to portray an image that would be considered sexually appealing, wild, or offensive.” In other words, they want everyone to think they’re cool. This article originally appeared on Pacific Standard magazine’s website.